Toxins that we use and are exposed to in our everyday life. This is a book you must have in your library and must refer to it often. Dr. James Martin makes a compelling case that toxins that are present in our environment and our food are responsible for most of the degenerative diseases that afflict us. To put it in simpler terms - due to the poisons in our air, water and food more of us get sicker and at a younger age. The message of the book is that not enough attention is paid to the scale of the problem and, instead of raising public awareness and actively reducing levels of pollution, we paper over the problems with quick fixes like synthetic chemical medicines. 1. More than 70,000 new man-made chemicals were created and put to use since Industrial Revolution. 2. Only about 300 chemicals were tested as carcinogens. Again, this 300 chemicals is out of more than 70,000 chemicals that we are exposed to, one way or the other. 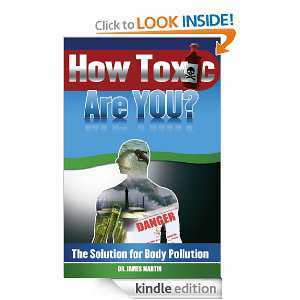 While Dr. Martin's view that toxic chemicals are to blame for nation's deteriorating health is not new, the book is scholarly and passionately written and suggests certain things we can do to reduce exposure to harmful toxins. Personally I feel that public awareness is rising and people are starting to prefer 'organic' foods and 'green' solutions to old ways. I do recommend reading this book to understand the sheer scale of the problem that toxic chemicals poise to our health and health of our children. DOWNLOAD THE BOOK HERE !! !